Be the first to share your favorite memory, photo or story of Angelina. This memorial page is dedicated for family, friends and future generations to celebrate the life of their loved one. Angelina M. Cruz, 86 years old, went home with our Lord after a brief illness. She was the beloved wife of Jose Cruz, whom she shared 58 years of blissful marriage with. Born in Manila, Philippines, she was the youngest of seven children of Mariano Medina and Flora Santiano. She graduated with a Bachelors degree in Education and worked as a bookkeeper in a housing government agency for many years before becoming a stay-at-home mother to her three children. Angelina's world was her family. She was a very dedicated mother who could instill joy and fun to any situation at home. She was a devoted servant of the Lord. 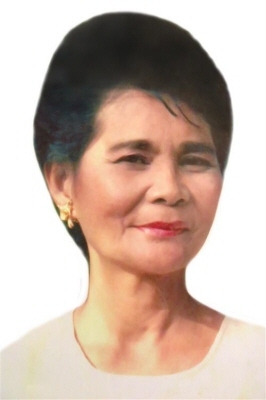 She was blessed to be constantly surrounded by her church sisters who called her "Nanay Lina" (Mommy Lina) for her motherly affection and wisdom. She is survived by her children, Eric Cruz and wife Lily of Toronto, Canada; Roberto Cruz and wife Marge of Beverly, Massachusetts; and Rowena Cruz Camilo and husband Cliff Camilo of Dubai, U.A.E. ; as well as her grandchildren, Erika Angela Cruz Santos and husband Vince Santos, Erik John Cruz, Pauline Allison Cruz, Roberto James Cruz and Lilo Olivia Camilo. A funeral service will be held in the Campbell Funeral Home 525 Cabot Street Beverly, MA on Saturday January 26, 2019 at 4p.m. Relatives and friends are invited to attend. Visiting hours will be held prior from 1 to 4p.m. Information, direction, condolences at www.campbellfuneral.com. To send flowers or a remembrance gift to the family of Angelina M. Cruz, please visit our Tribute Store. "Email Address" would like to share the life celebration of Angelina M. Cruz. Click on the "link" to go to share a favorite memory or leave a condolence message for the family.